The workshop schedule is coming together for spring 2019. Final details of each workshop should be published soon. If you'd like to arrange for private instruction in my studio, please contact me. I'd love to hear from you. I'll also be happy to schedule a workshop for you and others - up to 4 people total. 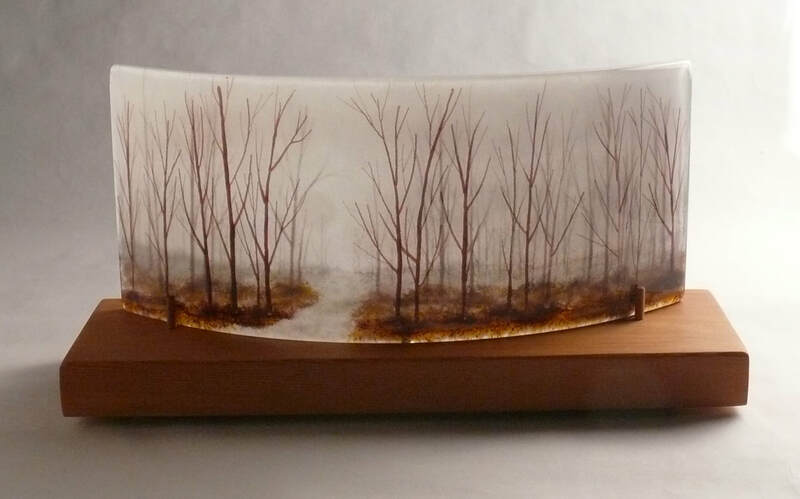 Learn to build luminous, three-dimensional layered glass landscapes using glass particles and powders. I am happy to answer any questions you might have, arrange your registration and send you more workshop & lodging information. By controlling glass size, volume and heat/time, you can make glass develop large or small abstract hole patterns or mimic the look of rods & stringers. You’ll create at least three projects, including a large-holed enamel-surface wall piece, a sheet of glass lace and a frit-drawn sculpture, plus several test and technique samples. This workshop will give you a solid grounding in open-face kiln casting, so you feel confident producing this kind of work in your own studio. Learn the basics of the lost wax method. The purpose of this workshop is to give you a solid grounding in kiln casting, so you feel confident producing this kind of work in your own studio. Make it a little studio party! 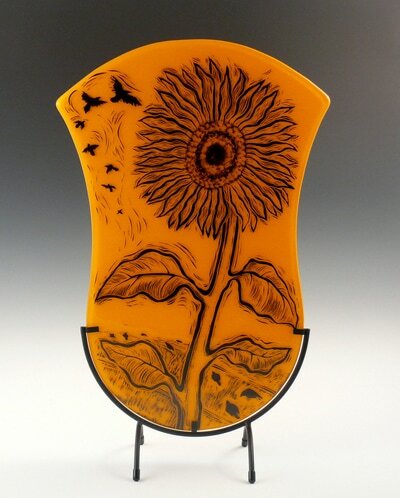 Learn to make fused glass with designs that look like block printing. It’s all glass - glossy and permanent. In this workshop you’ll learn the process from start to finish. You’ll create at least four projects, plus various technique samples. These will include a little bowl, a small square plate, a multi-color tile and a piece of wall art.